The students who participated in the Social Innovation Challenge, accompanied by their business advisers. 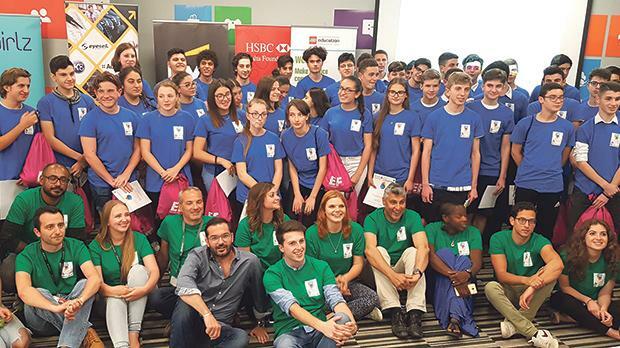 Fifty students from six schools recently competed in the sixth edition of the JAYE Malta Foundation Social Innovation Challenge. During the event student teams were tasked to develop an idea to solve a social issue based on real-life case studies. In this year’s challenge the students had to design a technological solution that would help promote inclusion and diversity in schools. The students had to use virtual reality sets, 3D printers or Lego Robotics, and explore how these emerging technologies could be applied in developing their social enterprise. The team from St Catherine’s High School, Pembroke, won this year’s challenge. It proposed a mechanised standing wheelchair that would make it easier for wheelchair-bound students to take part in sporting activities. The other teams came from St Dorothy’s School, De La Salle College, St Martin’s School, Verdala International School, Savio College and its scouts group. During the event the students were also given a master class of useful tips on web development by Darttek, a start-up companycurrently operating from the Microsoft Innovation Centre. The teams in the challenge were mentored by business advisers from Microsoft Malta, Ernst and Young and Corporate Gifts Malta. This annual social enterprise event is organised by JAYE Malta Foundation in collaboration with Microsoft.